Do more and do it quickly with the HP Color LaserJet CM6040f Multifunction Printer. Get speeds of up to 40 pages per minute in both color and black-and-white, and see your first page in just 12 seconds. Paper handling is impressive: a 100-sheet multipurpose tray and 4 x 500-sheet trays for a total capacity of 2100 sheets. A 50-sheet capacity automatic document feeder is included. Improve your CM6040mfp's productivity with the optional HP stapler/stacker or HP booklet maker/finisher accessory. Produce a greater variety of output with support for media sizes up to 12 by 18 inches (A3/SRA3) and weights up to 220 g/m2. Process complex documents fast without sacrificing performance with an 835 MHz processor and 512 MB standard memory (expandable up to 1 GB). Easily capture documents electronically and speed up workflow with scan to e-mail, network folder, and fax services. Included installation wizards make configuring send to network and desktop folder fast and simple. 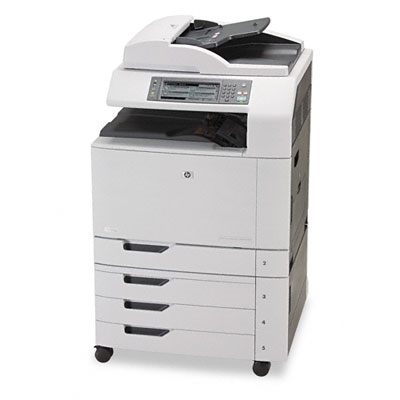 For high performance, competitive output quality, numerous features and efficiency, the HP Q3939A#BCC Color LaserJet CM6040f Multifunction Printer is the choice for all your office needs. Emulation HP PCL 5, HP PCL 6, HP postscript level 2 emulation; (HP postscript level 3 emulation supported); 80 HP font set (plus Greek, Hebrew, Cyrillic, Arabic). Media Types Paper (bond, recycled, glossy, mid-weight, heavy, heavy glossy, extra heavy, extra heavy glossy), transparencies, labels, envelopes, cardstock, tough paper, rough paper, user-defined. Media Weights All trays: 16 to 58 lb bond.